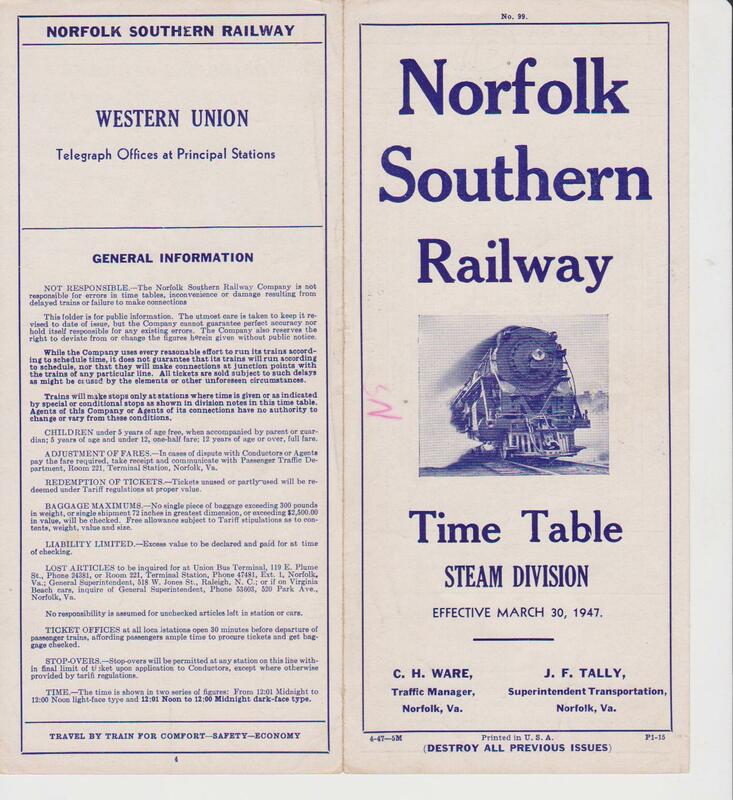 The Original Norfolk & Southern Railway that ran from Norfolk, VA to Charlotte, NC with various branches (Aberdeen, Asheboro, Beaufort, Belhaven, Carthage, Columbia, Durham, Ellerbe, Fayetteville, Goldsboro (A&EC), Jackson Springs, Lee Creek, Oriental, Snow Hill (A&EC), Suffolk and Virginia Beach, VA). It was merged into the Southern Railway system on Jan. 1st, 1974. Next N & S Historical Society Annual Meeting will be held in Spencer, NC at the North Carolina Transportation Museum for 2019 on April 27th. 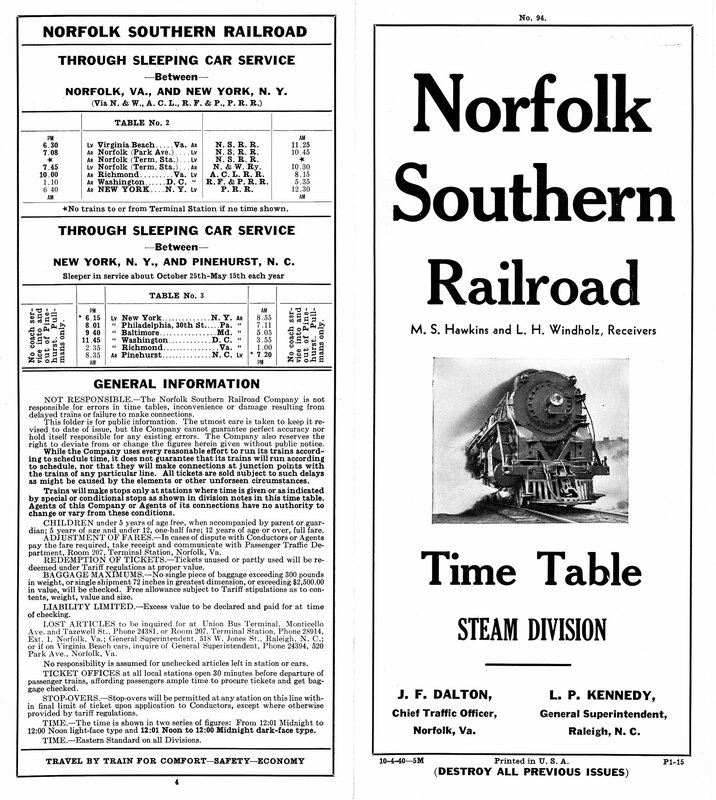 Added books Steel Rails Across East Carolina, Virginia's Belt Line Railroad: the Norfolk & Portsmouth 1898-1997 (NS discussed in interchange movements), Trackside around Norfolk, Building a town: Wendell, NC (Has articles and pictures of decades involving the NS) to NSArticles webpage. Added O scale InterMountain NS boxcar to NS Modeler page. Added Fuquay-Varina Museums to Links page. Added new Facebook group Norfolk Southern Railway Modeling link to NS Modeler page. Next Annual Meeting will be in the Robbins/Candor/Biscoe area on April 21st, 2018. Updated our new Treasurer Bob Zschoche on About Us page. Also updated our Structures page regarding Kinston depot demolition. Added links to NS Modeling page for new East Coast Railroad NS cabooses. Updated outdated links for the Ringling Museum's private railroad car Wisconsin on Equipement page. Added links to Archive.org from member John Dulaney of scans from NS Timetables and other paper on History page. 7:00 a.m.  Chase NS train E25 from Fuquay-Varina to Fayetteville. On return trip, visit NS caboose & #1801 FM locomotive. Visit Duncan Junction (Duncan depot, now gas station). 6:00 p.m.  Dinner at Cooleys Restaurant http://cooleysrestaurant.net/ Afterwards, slide show at Fuquay-Varina Women's Club at 602 N. Ennis Street (just a few blocks south of Cooley's)***note change of venue*. There are a number of NS and D&S artifacts on display here along with other memorabilia of Fuquay Springs and Varina. We will conduct our NS Society business in the old Varina train depot. 12:00 p.m.  1:00 p.m. Lunch - We will be dining at Aviator Tap House. 1:30 a.m.  Group Photograph Hopefully well be able to visit the NS 375 Caboose and have a group photo. This event will be open to the public and will be a fund-raiser for NS caboose at Fuquay. Tickets: Adults $10, Seniors (60+) $9, Children (2-12 yrs) $7, Children under 2 years free. Rain or Shine: open cars. Excursion: one hour. Arrive 30 minutes early. Limited for handicapped. Added Meeting Agenda for NSHS Annual Meeting above. Added new East Coast Railroad and Bowser model products to the NS Modeler page. Next N&S Historical Society Annual Meeting will be held in Fuquay-Varina on April 16th, 2016. N & S Historical Society 2015 Annual Meeting in Washington, NC on April 25th. See the lastest newsletter for more details, mailing out now. 8:00 a.m. - Gather at the Civic Center in Washington, NC, 110 N. Gladden Street. 1:00 p.m. - 2:00 p.m. Exhibit of Carolina Coastal Railway Equipment in the vicinity of Havens Gardens. 3:00 p.m. Follow the route of the abandoned original NS right-of-way between Pantego and Roper. Added several new models and updaed the Models page for new Atlas, Bowser and East Coast Railroads releases. Modified (above) change of date for NSHS Annual Meeting from April 18th to the 25th, 2015. Added Ken Lehman's article in Model Railroad Planning 2011 issue on Farmville, NC to NSArticles webpage. Updated History page (removed dead links) and added new No. 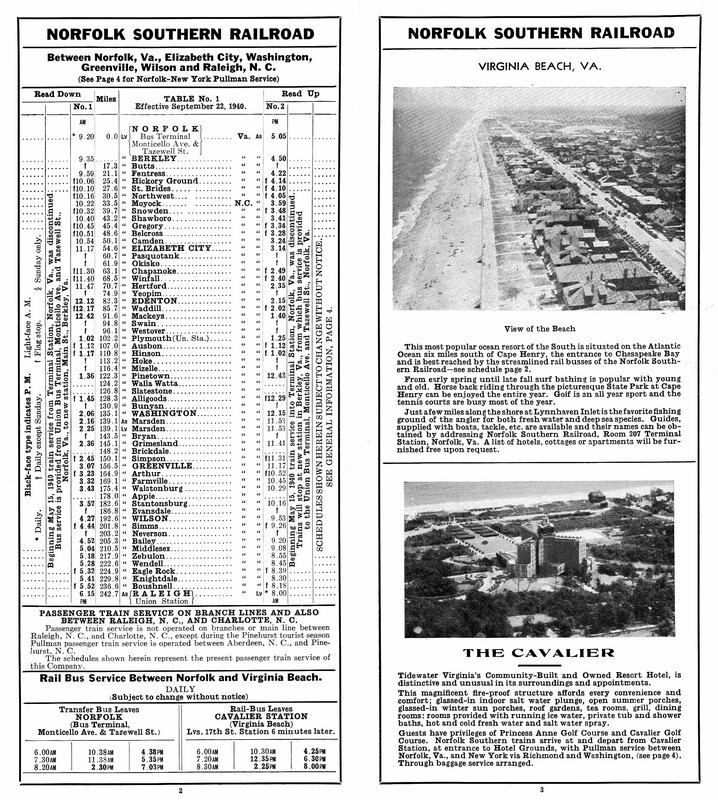 94 Timetable from 1940 (courtesy of Mike from East Coast Railroads). New models released from East Coast Railroads posted to Models page. 2-Bay 55 Ton Fishbelly (gray) Hopper Car kit with the correct stencil lettering like the original hopper cars. HM, BLT 6-41, C 4-67. Sand Loads (BH-006S) also available. 40' Double Door Box Car kit, White lettering with the correct stencil lettering like the original box cars. Removed some dead links from Local Links page. N & S Historical Society 2014 Annual Meeting was held in Fayetteville, NC for 2014 on April 25th - 27th. Activities included railfanning around Fayetteville and visiting local shortlines. 8:00am - Amtrak depot on Hay Street, railfan CSX local yard job to Vander and NS local P25, possibly Aberdeen & Rockfish. Sunday - The Red Springs & Northern motor car ride departed from Red Springs, NC at 10am on Sunday the 27th. Added new Atlas 50" Precision Design Box Cars to the Models page. Happy New Year! Added new Atlas NS Boxcars to the Models page. Added Freight Cars link to the History page. Added photos of NS 383 and NS 388 in Kings Mountain, NC to the Equipment page. The N & S Historical Society Annual Meeting has been moved from April 19th to April 26th due to Easter. Modeling a NS GE 70-tonner article posted to Model Railroad Hobbyist magazine's October 2013 issue. Added a book called Trains Rolling by H.A. McBride (1953) MacMillan, to the NSArticles webpage. New O-scale and HO-scale decals available for NS cabooses from East Coast Railroads on Decals page. NS wooden caboose 332 has found! Now located in private ownership in Decatur, TN. Relocated from Landrum, SC in 2011. Information posted to Equipment page. Former NS cabooses 365 & 367 have been found up in Indiana! Information posted to Equipment page. Learned that the contact@norfolksouthernhs.org was not working anymore and we deeply apologize for the inconvience. Please use railroad@nc.rr.com for e-mail for now and we'll route this to the right person. 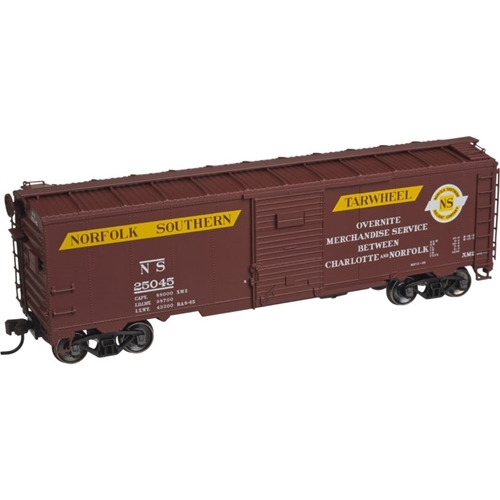 Added Great Decals NS to Decals page for NS boxcar 2300 with white N&S scroll logo. Added NS 611 Camp car photo to Equipment page. Currently being stored at Shearon Harris. Ready to Run and Detailed. Features: air hoses, windshield wipers, grab irons, coupler lift bars, operating headlight, window glass, can motor, flywheels, nickel silver wheels with RP25 flanges and knuckle couplers. Available with sound and DCC or just DC. DCC ready with 8 pin plug. New book called Locomotive Quarterly featuring NS Berkshire steam locomotives was added to NSArticles webpage. 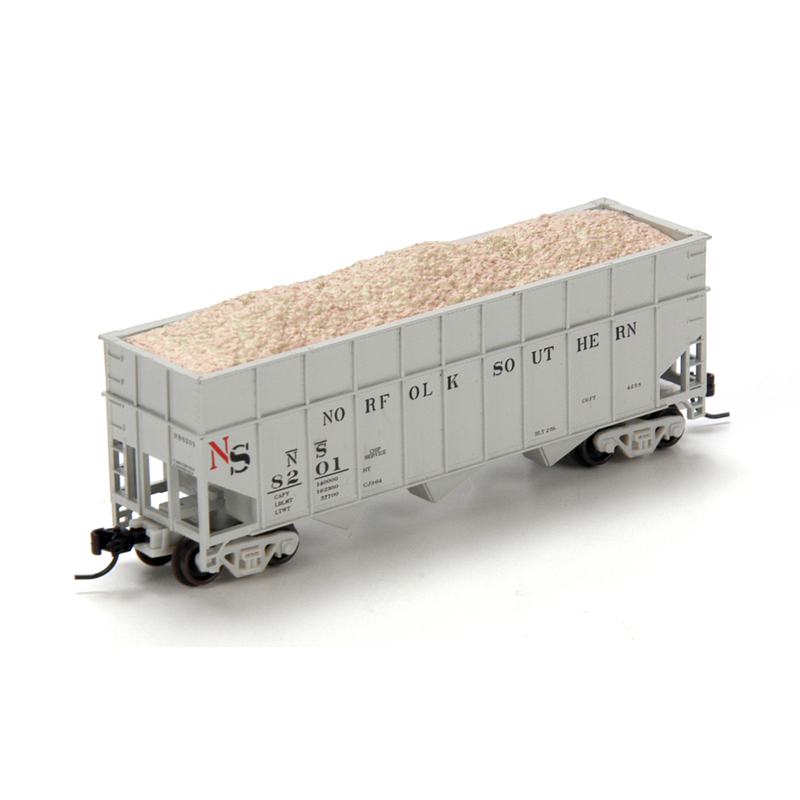 Added NS 50' boxcar to Equipment page. Former Norfolk Southern boxcar now used as a MOW storage shed on the GFRR Albany, GA 6/2/2013. The annual meeting will be at the former NS depot in Walstonburg, NC. Walstonburg is about 15 miles east of Wilson. It is slightly south of highway 264. Turn off of highway 264 onto highway 91 and go south for a short distance until you get to the railroad track. The meeting place (former depot) is at the crossing. This will cover operations and equipment of the original NS and present day operation and equipment of short lines on the former NS. Lunch will be a B-B-Q meal provided by the local American Legion at a nominal cost to attendees. This will coincide with a Proud to be an American celebration on the same day in Walstonburg. We will head east from Walstonburg and work our way to Wendell. We are most fortunate to have members Mike Seawell and Tom King to guide us on our tour. On this tour we will visit locations on the former NS. This will include buildings that are at their original locations and buildings that have been moved. Mike and Tom will enlighten us as to what used to be at sites that are now gone. Mike and Tom have spent a considerable amount of time in the area and have extensive knowledge of what went on at the time of NS operation . Places that we will visit include Wilson , Simms, Bailey, Middlesex, Zebulon, and Wendell. Heritage Locomotives at NC Transportation Museum July 3rd and 4th. Just a quick note to let everyone know that the Norfolk & Southern Historical Society will have a table set up in the round house at the NS Heritage Locomotive event at the North Carolina Transportation Museum July 3 & July 4. If you are attending the event drop by our table to say hello and enjoy a little Norfolk Southern conversation. Next N&S Historical Society Annual Meeting will be held in Wilson, NC for 2013 on April 20th. We will release more details as they become more refined. We are proud to see the new Norfolk Southern Corporation's unit 8114 released out of the paint shop. Click on the link to make the jump. "Norfolk Southern Railway Company 8114, Norfolk Southern's ninth heritage locomotive, rests under a colorful sunrise outside the paint shop at DeButts Yard in Chattanooga. Casey Thomason photo, copyright Norfolk Southern Corporation. For more information, visit www.nscorp.com"
paint scheme. We are thankful for our member's contribution and help towards this project. "Norfolk Southern Railway (SR, EMD) (not to be confused with todays Norfolk Southern) was a line serving southeast Virginia and northeast North Carolina, chartered in 1883 and acquired by Southern Railway in 1974." Here is an artist's rendering of the unit. Click on it for a larger version. Note: There is an $8 Entrance Fee. 3. Walking tour of Old Cape Henry Lighthouse, St. Teressa Church and the N & S Depot. 12:30 P.M.  2:00 P.M. Note: This will be a box chicken lunch from Bojangles  cost $7.00. 2. Program by members of the Tidewater Chapter NRHS re: N & S and operations at Little Creek Yard. 2:30 P.M.  3:30 P.M.
1. Meet at Newtown Road Station. Ride the The Tide to the end of the line and return. 1. Meet at the Railroad Museum of Virginia in Portsmouth for a tour conducted by members of the NRHS Tidewater Chapter. On the evening of April 20th, we will meet at 6:00 P.M. at Charlies Seafood Restaurant, for anyone interested. This is located at 3139 Shore Drive West (Hwy 60) between Lynhaven Bridge and Great Neck Rd. in Virginia Beach. Guaranteed Pre-orders through 02/25/2011. Estimated arrival 3rd Qtr 2011. MSRP: TBD. Model Railroader Club Offerings NS 40-foot Boxcar. The May 2011 issue of Model Railroader magazine on page 13 has an ad about our 40-foot NS Boxcars custom made by Bowser. They are also listed in our NS Modeling page. Walthers decals scanned and posted to the Modeling page. the white, red, and yellow emblem shown in the top corner of the photo of the finished model. Trucks and couplers not included. Accurate trucks are available from Tahoe Model Works (shown on model above. ), $40. Added new Speedwitch NS 25325 to the Modeling page. Added new Atlas 1932 ARA Box Car to the Modeling page. Three numbers available in both HO and N scale (25229, 25246, 25499). Added DME 16652 covered hopper to the surviving equipment page. Removed "Save the NS 701" page since it was scrapped in Laurinburg. 1:30 PM - Viewing of former New Bern Union Station mural, New Bern Academy Building (Academy Museum), New and Hancock Streets (500 Hancock St). NS 2007 added to surviving equipment page as THNR 2886. Three Notch R. R.
Added new Athearn Wood Chip Hopper to the Modeling page. Several numbers and 4-packs are available with new 4-pack sets being made for 2010. Added S. David Carriker's book "Railroading in the Carolina Sandhills: Volume 1 & 2" to the NSarticles page. We will be meeting in New Bern, NC on Saturday, April 17th, 2010. The agenda will be announced in the next month. Thought you may be interested in hearing about this former NS caboose, No. 384. See the attached photos. The caboose is located on private property, but I was allowed to take some photos back in 2006. As you can see from the photos, it has been made into a cabin with a stick-built addition extending off the left side between the bay and the A-end, and a deck along the rest of that side all the way to the B-end platform. From the placement of the addition, a hole had to be cut in the side of the car near the A-end on the left side. How big the hole is I had no way of determining. The B-end leaf-spring truck had NOR-SOU. RR. cast on the side-frame. I did not check the A-end truck. The car is south of Cordele out of view on the east side of US41 just north of the GA300 interchange. You may be able to spot it on Google Earth. We will be meeting at the NC Railway Museum in New Hope (Bonsal, NC) on Saturday May 2, 2009. The agenda will be as follows. 9:30 to 11:30 AM The railway museum will be open for walking around the various displays and the company store should also be open to accept any funds you want to spend. 12:15 to 1:30 PM The Business meeting will be on one of the train cars. 2:00 to 3:30 PM Train ride. The Museum may be able to do a run by. Since there are no restaurants close by, we have made arrangements with Old Time Barbecue to cater a lunch. The menu will be Eastern Carolina Pork Barbecue along with hush puppies, potatoes and green beans. Drinks will include Sweet Tea and Lemonade. If you would rather have something else to eat or drink, you will need to bring it with you. A $9.00 donation per person is suggested. The Society will have to pay for any difference in the total bill. At present we have given a number of 60 people to Old Time. Make sure that you send back the enclosed flyer with the total number of people that you intend to bring to lunch. Money will be collected on May 2nd. The Society has also had to commit to a cost of $375.00 to the NC Railway Museum for the Train ride. The cost of an adult is $9.00 and children 12 years and younger is $6.00. The total seats on the Train are 239 seats. To pre reserve seats please send in your money along with the enclosed form. You will be able to pick up your tickets after 9:30 AM on the 2nd. You can also invite your non member friends to ride the train, as long as someone pays for the ticket. The Train ride will be a first come first serve basis. If we go past 239 then we will have a standby list. If you have any questions you can contact me (John Janosko) at 919 656 6897. Hope everyone can come and I for one intend on having a great time. c/o North Carolina Railway Museum, Inc.
All donations are tax deductible. Please help us in this worthwhile cause, and keep our common history alive. These 70-tonners once ran the rails at Bonsal, NC during construction of the relocation of the NS rail line during the building of Jordan Lake, so it would be fitting that we bring one of them back to the New Hope Valley Railway! They were the first NS purchase of locomotive power other than Baldwin since 0-6-0 number 14 back in 1900. Delivered to the NS from GE in June 1948, they were the only 70-tonners used to pull the mail and express trains (#1 & #2) between Raleigh and Norfolk, VA. The last run of the mail train was December 12th, 1951 and after that, these engines were used in local and branch line service and as switchers at the smaller yards. After #702 was sold in 1964, the other two (701 & 703) spent most of their time around New Bern and on the Bayboro Branch. After the 1974 merger with Southern Railway, they were repainted again into the Southern black colors and remained on the SR roster until 1978. The Norfolk & Southern was the only Class 1 railroad to have its' Headquarters located in Raleigh, NC. This marks the new update website (actually third revision) for the Norfolk Southern Historical Society. Hopefully this will make it a bit easier to keep up with any new changes to the website.